A new web-based Scantron tool has been created for K-State Online Canvas. A big benefit of this new Scantron process is the ease of use and the analytics. Instructors will also like the improved organization workflow, which allows for all the test information to be located in the same place. The new version of Scantron will be available for use in K-State Online during Spring 2016. 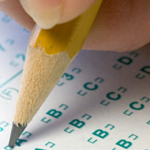 To learn more about Scantron, view the Scantron webpage.